Does your organisation lose important bids on Price? Perhaps your bid was actually too low and you left money on the table? For most companies, the days of adding up your costs and applying a profit margin are long gone, but Price to Win will help. Many companies are bidding bespoke solutions, into new markets or against unfamilar competitors. These solutions don't have an established market price and will never be bid again! If you recognise these problems, Price to Win will help. 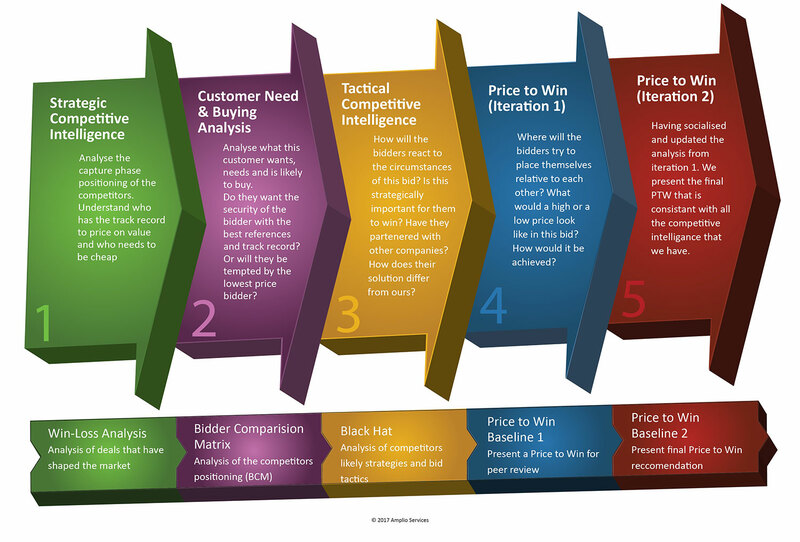 Price to Win is a process to define "the optimal price at which our organisation can bid and win, for a given probability of winning (PWin)". Our process has been proven to improve profitable bid wins in multiple industries, many times. Amplio offer a range of Price to Win services depending on whether you want to build in-house capability or buy Price to Win as a Service. Amplio have teamed with Shipley to offer Price to Win training in support of companies wanting to develop their in-house capability. We also work with select customers providing an end-to-end Price to Win service. Arrange a consultation to discuss how we can help you win more bids. See our blog where you can download our White Paper giving you more detail about how Price to Win works.